As a marketer, do you want to know how many contacts opened your email or did not open your email? Do you want to know the number of unique clicks on your email? Do you want to know if there were any hard bounces or soft bounces? 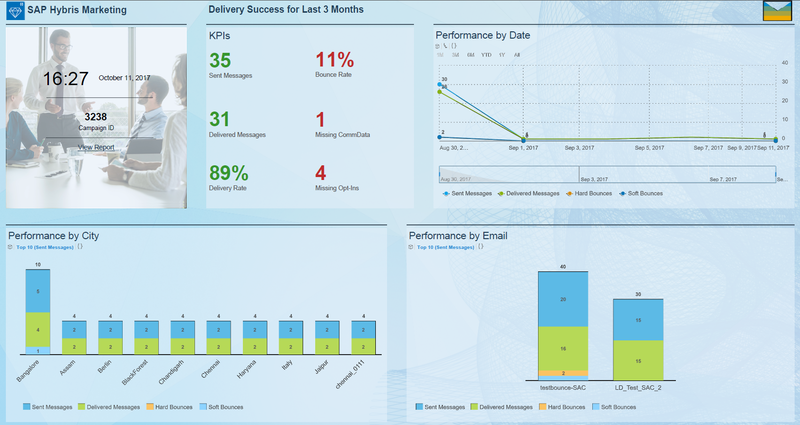 Do you want to keep track of key KPIs related to email delivery and email engagement? Marketers create compelling campaigns in SAP Hybris Marketing Cloud to send emails to their customers or potential customers to give update about their products and services. It is important for marketers and upper management to know how well their email campaigns are performing and tracking key email campaign success metrics becomes crucial. In SAP Hybris Marketing Cloud, marketers view success metrics of an email campaign in the Success tab of an email campaign. 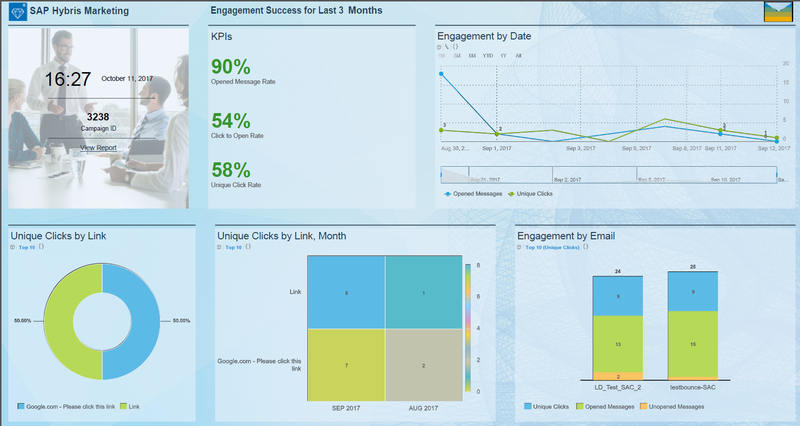 Marketers can now view detailed email campaign success information using the Success Metrics Per Email Campaign, Last 3 Months analytics story in the SAP Hybris Marketing Cloud SAP Analytics Cloud (SAC) tenant. This analytics story is available for SAP Hybris Marketing Cloud (1711 Release) and SAP Hybris Marketing (1709 On Premise Release) customers. Ensure that the SAP Analytics Cloud (SAC) tenant is integrated with SAP Hybris Marketing or SAP Hybris Marketing Cloud. Log into the SAP Analytics Cloud. Choose Browse > Stories from the main menu. If you are using SAP Hybris Marketing Cloud, please refer to the user documentation on SAP Hybris Marketing Cloud home page at http://help.sap.com/mkt > Integration > Integration Guide 1711 > Integration Scenarios > Application-Enabling Integrations > Integration with SAP Analytics Cloud (SAC). If you are using SAP Hybris Marketing, please refer to the user documentation on SAP Hybris Marketing home page at https://help.sap.com/viewer/p/SAP_HYBRIS_MARKETING > Integration > Integration Guide 1709 > Integration Scenarios > Application-Enabling Integrations > Integration with SAP Analytics Cloud (SAC). This analytics story displays success metrics for an email campaign (randomly picked) available in SAP Hybris Marketing Cloud system by default. A marketer can choose the Campaign ID filter and choose an email campaign ID to view the success metrics of an email campaign. In this operational report, marketers can view detailed success metrics of an email campaign. This story contains three tabs – Summary, Email Delivery and Email Engagement. Also, note that if your email campaign contains text messages, metrics for text messages are also displayed. The tabs are explained briefly below. In the Summary tab, a marketer can view the summary of email campaign performance metrics and key email campaign KPIs such as Opened Message Rate, Unopened Message Rate, Unique Click Rate and Bounce Rate. A marketer can also view the records of email campaigns of each contact for measures such as Sent Messages, Delivered Messages, Opened Messages, Unopened Messages, Unique Clicks, Missing CommData, Missing Opt-Ins, Hard Bounces, and Soft Bounces. Performance by Date – Track how many messages were sent and delivered daily. You can click 1M to view messages that were sent and delivered last month and click 3M to view messages that were sent and delivered in last 3 months. Performance by Email – View how each email has performed based on number of sent messages, delivered messages, hard bounces and soft bounces. A marketer can also click on the View Report link to view the detailed email delivery report, where records of email campaigns based on email delivery metrics such as Missing Opt-Ins, Missing CommData, Delivered Messages, Hard Bounces, Soft Bounces, Sent Messages. Click Back to navigate back to the Delivery Success for Last 3 Months page. Engagement by Date – Track the engagement of your email messages by analyzing how many contacts opened messages and how many unique clicks happened daily. You can also click 1M to view the chart for last month and click 3M to view the chart for last three months. Unique Clicks by Link – View percentage of how many unique clicks happened on a content link name in an email. Hover your mouse on the pie chart to view to see the number of unique clicks. Unique Clicks by Link, Month – View the heatmap on how many unique clicks happened on an email content link per month. If you click on the URL name, you can view the URL. Click on the URL to navigate to the Webpage. A marketer can also click on the View Report link to view the detailed email engagement report, where records of email campaigns based on email engagement metrics such as Unique Clicks, Opened Messages, Unopened Messages. Click Back to navigate back to the Engagement Success for Last 3 Months page. With the power of Success Metrics per Email Campaign analytics, track the success of your email campaign created in SAP Hybris Marketing Cloud by keeping a tab on the performance of delivery and engagement of your email campaigns!